Facebook/Sunshine Moody PhotographyAllen Halstead and his grandson, Kolbie Gregware. 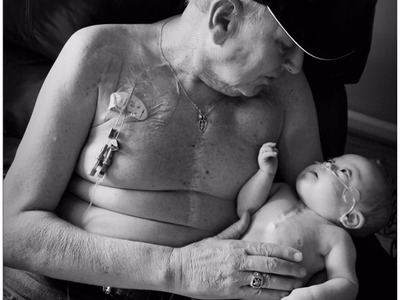 A grandfather and his grandson both survived open heart surgery. Now, their matching scars have helped them create a special bond. Alabama-based photographer Sunshine Moody recently captured a series of heartwarming portraits showcasing Allen Halstead and his grandson, Kolbie Gregware, the Daily Mail reports. Halstead has had two open heart surgeries, 18 stents, a stroke, a stroke, and several small heart attacks, leaving his heart at 10% function, according to a Facebook post by Brandy Gregware, Halstead’s daughter and Kolbie’s mother. Kolbie, on the other hand, was born with a heart defect, chronic lung disease, kidney disease, and Down syndrome. He had his first open heart surgery at just 4 months old, and has spent 7 of his 10 months of life in a hospital. “This past year has been extremely hard for our family because both have been in and out of the hospital and us not knowing if they would make it home,” Gregware wrote. But these trying experiences have brought the grandfather and his grandson closer than ever. See more photos of Kolbie, Halstead, and their entire family at Sunshine Moody Photography’s Facebook page.